A short while ago, we took a very fond and nostalgia-laced trip down memory lane, revisiting Production Central’s original slate of attractions. It’s time to continue our time-traveling adventures, this time focusing on the next stop as we work our way through the Universal Studios Florida of old: New York. The New York backlot, interestingly enough, hasn’t seen the sheer amount of turnover that its neighbor, Production Central, has over the past 28 years; whereas our first article only included the opening-day experiences located there, this one will actually be able to encapsulate every extinct attraction that has lined the faux streets of NYC, ranging from the opening day of June 7, 1990 all the way to just last decade (yes, the land’s current inhabitants are remarkably young). We can thank the backlot for not changing its premise at all over the past three decades for this (hey – a fake movie set is a fake movie set), but that isn’t to say there hasn’t been any major change-ups – in fact, if anything, the land has actually had its number of attractions shrink over the years instead of expand, like at Production Central. In fact, let’s go ahead and get one of the more interesting historical factoids out of the way right now. During Universal Studios Florida’s early years, the section called New York originally encompassed not only the area that we know and love today, but it also stretched out towards the park’s central lagoon, hugging the body of water all the way around to Central Park, which faces NY proper on the other side. 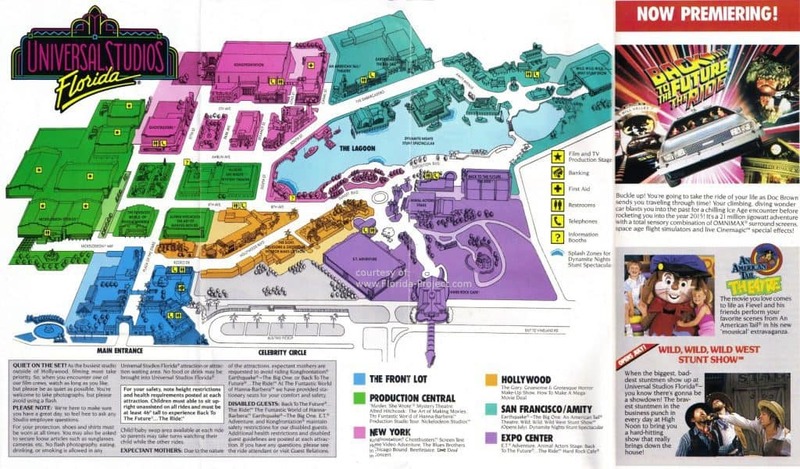 At some point along the way, this would change; the waterfront Battery Park would become part of Production Central, and Central Park would be assimilated by Hollywood (a topographical alteration that has been repeated elsewhere at the park over the years, as well). But the next time you’re strolling around the lagoon, you’ll now know why the theming all along its one side is inconsistent with its immediate surroundings – and why Central Park isn’t, in fact, in New York, next to Gramercy Park and Finnegan’s Bar & Grill. Enough with the 1990s minutia – let’s plunge into the main attractions themselves, shall we? Although only consisting of two feature films and an at-the-time just-ending animated series, Ghostbusters was still one of the hottest intellectual properties of the early ‘90s – and Universal was only too happy to have the franchise be represented on the opening day of its brand-new park. 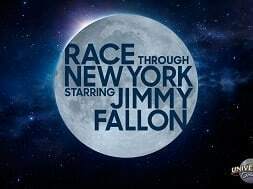 Face the howling, growling fury of Hollywood’s biggest star as he stalks you through New York City and traps you in a cable car so high above the East River, you’ll swear you’re on screen with him! 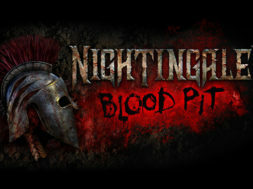 It’s a terrifying trip you’ll thrill to for years. 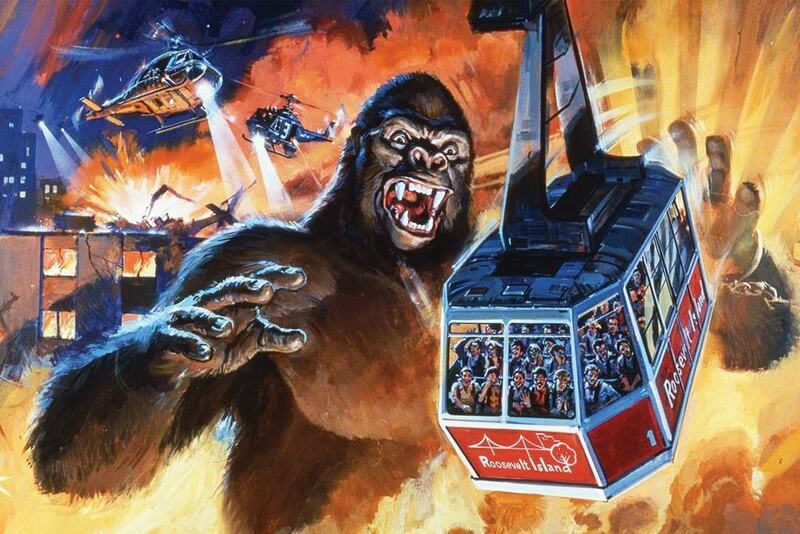 Kongfrontation’s story went a little something like this: with the King on the loose in NYC, guests are being herded to Manhattan’s Roosevelt Island tram station (the show building’s façade was – and still is – themed to the famed Pennsylvania Station from the turn of the 20th century) in order to be evacuated. The lovingly-detailed queue was fully based off of the 1976 remake of King Kong, from its graffiti-laden subways to its fully-stocked storefronts to its clips of Kong running amok in the city, which were framed by an actual local New York news anchor, WWOR-TV’s Rolland Smith, providing “live” updates. 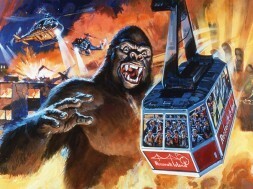 The ride experience itself consisted of guests boarding a tram that was suspended from the ceiling while passing by huge audio-animatronic versions of the great ape. 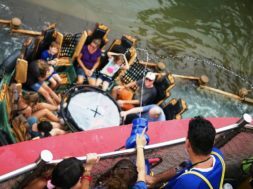 As with the park’s other big ride at the time, Jaws, an actor served as your “tour guide,” narrating your trip to safety as you survived explosions, police helicopters, and, of course, a few attacks from King Kong himself. Eager to populate its park with ever more attractions – a mentality which has reappeared in the current Comcast-owned period of Universal Orlando’s lifespan – Universal ushered in several new experiences for its park’s second year of operation, with a particular emphasis on stage shows (the company unofficially referred to this as USF’s second grand opening, and it included the still-present and ever-popular Blues Brothers Show). The first of these additional productions was Beetlejuice Live Dead in Concert, which took the popular character and had him team up with the Ghostbusters (why not?) in a whacky performance that saw the Ghost with the Most possess the Ghostbusters and have them dance to a smattering of pop songs, most of which were brand-new at the time (such as Madonna’s “Vogue” and MC Hammer’s “Can’t Touch This”). Beetlejuice’s first Universal performance wasn’t a particularly good one, if we’re being honest, but it did prove to be very influential: it essentially served as the roadmap for Beetlejuice’s Graveyard Revue, a permanent production that would be placed in the next-door San Francisco in 1994 and which would run for a whopping 22 years (one just has to switch out the Ghostbusters for Universal’s classic movie monsters, and he has much of the new show laid out before him). 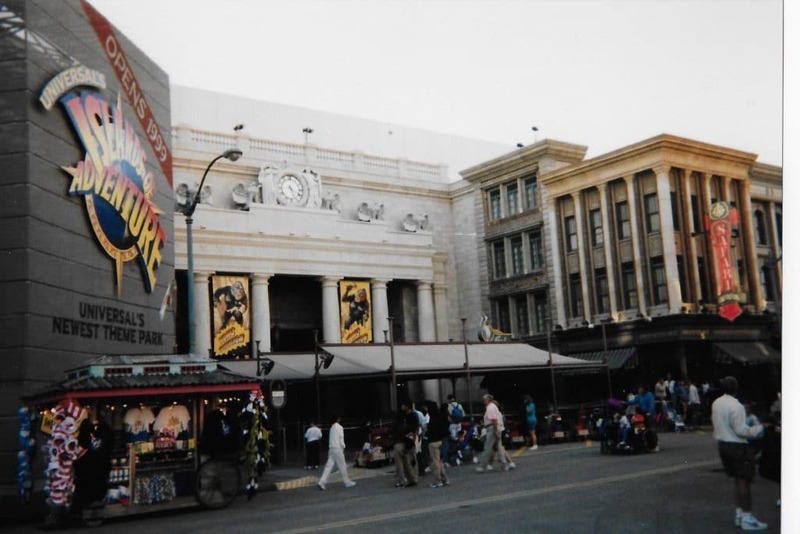 There was an extra space sitting right in front of Kongfrontation (where Revenge of the Mummy’s entrance now resides), and there was an opportunity for extra money to be made in the park. Both of these factors combined to create Screen Test Home Video Adventure, Universal Studios Florida’s first upcharge experience. The premise behind Screen Test was, essentially, to provide yet another way for visitors to experience the magic of filmmaking. Guests would be filmed in front of a bluescreen by Universal’s “Cinemagicians,” and they would get to select one of two templates to be inserted into: tourists could either be placed on the bridge of Star Trek’s USS Enterprise-A or they could “relive [their] day with King Kong, E.T., and Earthquake” in a type of greatest-hits mash-up (the formal name for these scenarios was “Star Trek Adventure” and “Your Day at Universal Studios,” respectively). The resulting eight- to 10-minute videos could then be purchased for the tidy sum of $29.95 – which was almost exactly the price of a one-day ticket to the park at the time. 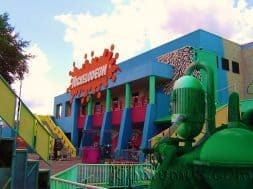 As Islands of Adventure – which would, of course, eventually include an entire land for Marvel Comics and its panoply of superheroes – was first being sketched out in the early ‘90s, Universal was already in the process of incorporating the iconic comic-book characters into its pre-existing park. Called Marvel Super Heroes Showdown, this stunt show took a page out of Beetlejuice Live Dead in Concert’s playbook, staging itself right in front of the building that housed Ghostbusters Spooktacular (it even one-upped its street-show predecessor by using the surrounding buildings’ roofs to have various heroes and villains rappel down the walls and join the fray that was happening down below). Showdown’s story incorporated a wide cast of characters that would soon find for themselves a permanent home over in Marvel Super Hero Island – and which are even more fitting in today’s pop-culture climate, with the ongoing success of both the Marvel and X-Men Cinematic Universes. Tony Stark, that eccentric billionaire who is secretly Iron Man, has agreed to help fund a new mutant initiative that Professor Charles Xavier has just undertaken. Mr. Sinister uses this as the perfect opportunity to stage an attack, however, hoping to forcibly make humankind evolve into a mindless, mutated army (cue the arrival of Wolverine, Spider-Man, Storm, Mystique, and Sabretooth, who are eager to either hinder or help the baddie’s plan). Many fisticuffs and ‘90s-era rock music (not unlike Super Hero Island’s soundtrack) ensue – along with character meet-‘n-greets, which would follow the performance. 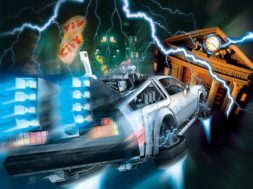 There seems to be two contributing reasons as to why Marvel Super Heroes Showdown was a rather short-lived affair: firstly, the sealing of the comic book characters’ presence at the future Islands of Adventure might have made park management think that the stunt show was a redundant use of money; and, secondly, the impending demise of Ghostbusters Spooktacular – and the subsequent arrival of Twister: Ride It Out – would have marked the production’s “stage” as endangered, anyway. 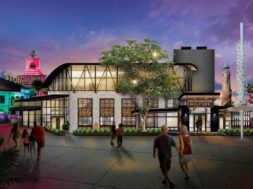 The expansion of Universal Studios Florida into Universal Orlando Resort (or Universal Studios Escape, as the resort was originally [and shortly] known) was a momentous occasion for the company, realizing a long-held dream. To help celebrate the long-awaited event, and to help drum up excitement among guests, Universal opted to remove Screen Test Home Video Adventure and replace it with the Islands of Adventure Preview Center. The exhibit is exactly what it sounds like: a giant, walk-through preview of what would eventually become, in two years’ time, the next-door Islands of Adventure theme park. A series of five rooms brought the new park’s five (original) islands to life, combining concept art, displays, and Islands’s signature music, helping to establish the gist of what each land would have in store. The project obviously didn’t have the biggest of budgets, but it also succeeded in building excitement and anticipation for what is still regarded to this day as one of the best theme parks in the world. Once Islands did open, Universal would keep the Preview Center operational, using it as a place where Universal Studios Florida visitors could pick up admission for the new park – a change which eventually, by the end of 2000, showed up in its name, as well: Universal Orlando Vacation Services (see how quickly the Universal Studios Escape moniker was dropped?). When Kongfrontation was headed for the chopping block just a few years later, Vacation Services went with it, as Universal decided, at long last, that the best use of this additional space was not for any type of add-on experience but as an integrated part of the upcoming Revenge of the Mummy. Twister: Ride It Out was a technological behemoth when it first took over the Ghostbusters’ residence in the summer of 1998, employing a wide array of special effects in order to create a twister right in front of guests’ eyes – including flames, xenon strobe lights, flying debris, and 65,000 gallons of water. And then there are the high-powered fans that were used to generate the twister itself, pumping air out at a crisp 35 miles per hour (enough to fill four full-sized dirigibles), which were accompanied by 54 separate speakers and 42,000 watts of electricity in order to make that mini-cyclone feel as powerful as possible. The 25,000-foot soundstage the attraction resided within, which housed a recreation of the Wakita, Oklahoma drive-in from one of Twister’s most iconic scenes, came to life all around visitors – especially when the floor would shutter at the very end of the experience, providing one last thrill before tourists would shuffle out back into the sunlight. What Ride It Out most became famous for, however, was its (mostly unintended) cheese factor. The outside of the show building was festooned with miscellaneous items that happened to be blown into – and, sometimes, through – the walls, such as a tractor, perhaps making the attraction a bit conspicuous in its New York setting. This motif was carried over into the pre-shows, the second of which featured television sets that were similarly embedded in the walls, and the actual show experience itself, which starred the Esmoo cow being whisked away right in front of the audience (we’re happy to note that one of Twister’s cows is now proudly owned by OI publisher Taylor Strickland). And then there’s the late Bill Paxton, whose deadpan, monotone delivery of his dialogue – and his apparent feuding with co-star Helen Hunt, which necessitated them being displayed on two different screens within the attraction – has become the stuff of theme-park legend. In 1997, six years after the original Ghostbusters animated series (what is usually referred to as The Real Ghostbusters) ended, a spinoff show was commissioned that sought to introduce the next generation of Ghostbusters to the world: Extreme Ghostbusters, which followed Professor Egon Spengler recruiting his college students to form the new team. It only lasted for one season, ending in December of that year, but, apparently, someone at Universal enjoyed the attempt at a franchise revival enough to use it as the basis of another production at Universal Studios Florida. Called Extreme Ghostbusters: The Great Fright Way, the new street show was almost literally the same exact number as its theme-park antecedent, Beetlejuice: Live Dead in Concert. That “spirited spirit” would show up, sing corny versions of famous songs, and then possess the Ghostbusters once they arrived to capture him, making them, in turn, lip sync and dance their way through various pop songs from the previous 15 years (including, this time, tunes from Marky Mark, Britney Spears, and NSYNC). It makes one wonder why the original performance was cancelled in the first place, nine years previously. Again like its forbearer, The Great Fright Way proved to be rather short lived, ending after just three years, when Universal opted not to renew its contract with Columbia Pictures for the rights to Ghostbusters (although, to this day, a goodly swath of merchandise dedicated to the property can still be found scattered throughout Universal Studios Florida). This back corner of New York has remained empty ever since – a fate which Hollywood Rip Ride Rockit’s arrival in 2009 seemed to forever seal, as the presence (and noise!) of a roller coaster seems to preclude any type of performance from being held. Want to tour the rest of Universal Studios Florida on its opening day in 1990? Be sure to check out our in-depth retrospective – or you can discover all of the New York backlot’s myriad secrets in our massive feature. And for even more on Universal Orlando, Walt Disney World, and other Orlando experiences, be sure to follow Orlando Informer on Facebook, Twitter, and Instagram.